Bert Aalders studied horn, orchestra conducting, choir conducting and band conducting at the conservatories of Arnhem and Zwolle in The Netherlands. After playing horn in the symphony orchestra of Gelderland, he became president of the Music Information Centre Gelderland in 1990. He conducted several community bands and has given many workshops and masterclasses in different countries around the world. He is a member of the artistic committee of several music festivals and board member of the Dutch Conductors Association. In 1997 he became board member of WASBE ( World Association for Symphonic Bands and Ensembles ) and in 2005 he became president of WASBE during the conference in Singapore in July 2005. In the summer of 2005, he became a member of the committee of WMC ambassadors during the World Music Contest in Kerkrade from 7 – 31 july. 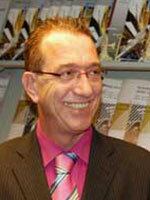 Since 2008 he has been General Manager of World Projects Europe.